In addition to traditional academic papers, students in my classes often have a project option. Students in my summer 2015 course SO-201: Social Issues made connections between the first episode of Orange Is The New Black Season 3 and Jill McCorkel’s Breaking Women (NYU: 2013). They did this with an epic live-tweet that Dr. McCorkel joined us for–see the Storify version here. Kate Schwarz ’15 curated a Tumblr page to make connections among feminist art, gender stereotypes, and individual experiences. See her site, created for SO-251: Media & Representation (Spring 2015) here. “The Show Your Sport Campaign is an annual project brought forth by Skidmore’s Student-Athlete Advisory Committee (SAAC). Show Your Sport is a multifaceted initiative designed to create awareness, increase education and enhance visibility for social issues. Each year SAAC representatives collectively decide on a social issue of national and/or personal concern to address as a community. Through poster campaigns, consciousness-raising, guest lectures, and other interactive efforts, Show Your Sport highlights student-athletes’ involvement in social and community activism. The 2015 inaugural campaign centers on the issue of homophobia in sports. The strength and success of Skidmore Athletics would not be possible without the contributions of queer and ally athletes, coaches, and peers. The campaign’s photographic component features queer and ally athletes in order to create visibility and promote allyship within and beyond athletics. 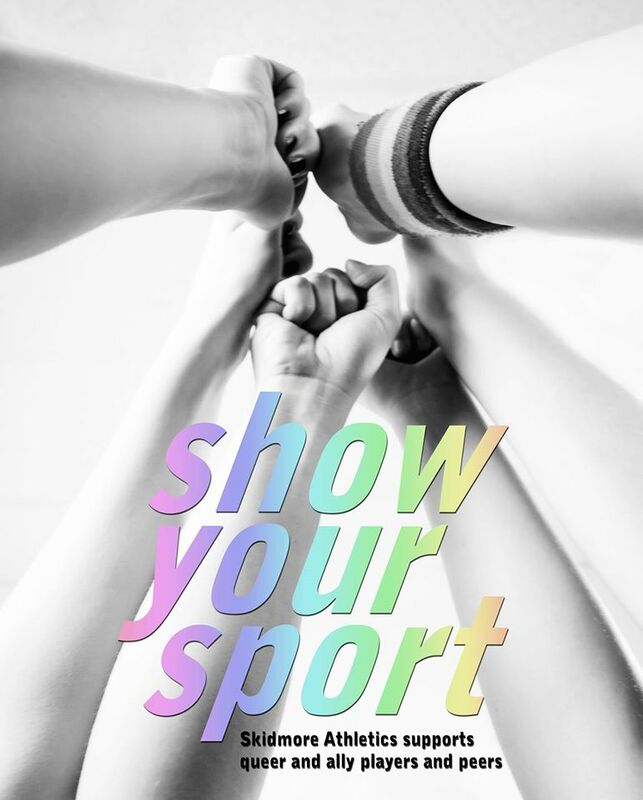 The Show Your Sport Campaign believes in the power of student-athletes to create positive change. Student-athlete leaders engaged in this campaign commit to upholding community standards of inclusion, compassion, and social awareness. See more images from Show Your Sport on Aria Goodman’s portfolio site. Kenny and Goodman were featured on Autostraddle.com in July 2015as part of the website’s series on young activists. Skidmore College featured the project on their website, and the Skidmore News wrote about Kenny and Goodman’s project, which will continue as a SAAC-funded campaign after their graduation.